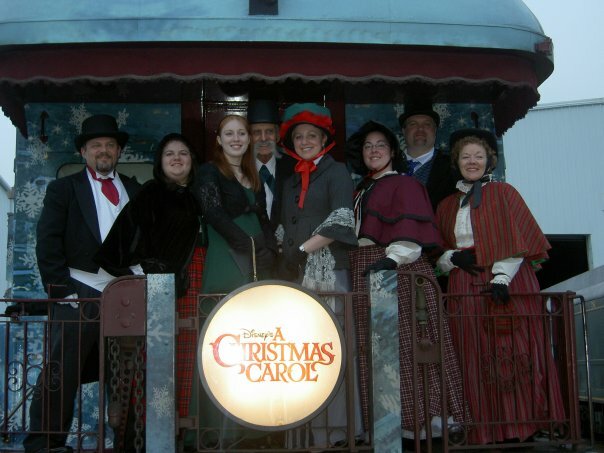 This is me (center, big green hat, red bow) with my Victorian caroling group. I don’t know about you, but for me, the past few weeks have been anything but the Most Wonderful Time of the Year. There’s just too much going on. My hubby’s calendar is slam-packed. In the past 11 days, we’ve had ONE–count it–ONE family dinner together, just the four of us. Yes, I need to slow down. Yes, I need to learn to say no. Yes, I need to lighten my load. But it’s impossible for me to lighten the load right now, so I’m feeling mighty burnt out instead of mighty full of the joy of the season. I recently wrote a post on hearing the voice of God, and He’s made it perfectly clear that even in the chaos of life right now, I need to pay attention to how I’m handling it. No matter how much hustle or how much bustle I’m dealing with, I’m to do everything in the name of the Lord. Everything. So I smile (although my smile might be a little weary) and I remember with great joy that there would be no Christmas season without the birth of our blessed Savior. I will make hustle and bustle, chaos and craziness a blessing to myself, my family, and those around me in the name of the Lord. Every moment is an opportunity to act and react to my circumstances in the name of the Lord with thanksgiving in my heart. thanks for the reminder! oddly enough, I am abnormally relaxed this year. I have been reading and blogging about gifts and gratitude, and I think it has really helped me prioritize. That…or I am in denial! I would ask you about a coffee date…but don't want to add to your crazy schedule. maybe January? You look adorable! My favorite Carol is What Child Is This (Greensleeves) and Do You Hear What I Hear. Top 2 anyway! Oh my word, look at you all dressed up! You need to wear that to the banquet at next year's conference. ;)I pray God blesses you in the midst of the chaos, my dear friend. i like O Holy Night the best. i think it's the swell of the music, along with the lyrics, that i like best. you are completely adorable in your christmas carol digs. love the photo! Thanks, y'all! I actually have a cape I've been wearing this year because it's been mighty chilly for our evening events. It's the hat that takes the costume over the top. Who doesn't love a giant hat with red feathers & a bow? ?